Since the article was first originally published, we have had over 1600 comments from consumers who have used the Rust-Oleum Deck Restore and have had a poor experience with peeling and failure. If you have used Rust-Oleum Deck Restore please upload and post pictures of your exterior wood or deck. A short description of your experience would be helpful as well. This can be done in our comment area below. Feel free to also submit a Star Rating on the Rust-Oleum Deck Restore coating. Even though they have settled this lawsuit, Rust-Oleum Deck Restore is still sold to unsuspecting consumers and has not been pulled from the shelves. Rust-Oleum Deck Restore is a water-based, low odor product that is designed to mask the wood not allowing the wood grain to show. It is marketed as a thick paint product for wood decks that is outside of conventional restoration. Recently there have been investigating claims on behalf of customers who have used Rustoleum Deck Restore on their decks. Rustoleum Restore has been alleged of being prone to premature failure. When it is applied to exterior wood it may be susceptible to bubbling and/or peeling, which can lead to costly repairs and replacements. Since the article was first originally published, we have had numerous comments from consumers who have used the Deckover and have had a terrible experience with peeling and failure. 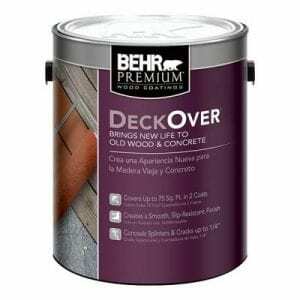 If you have used the Behr Deckover, please upload and post pictures of your exterior wood or deck with the Deckover on it. A short description of your experience would be helpful as well. This can be done in our comment area below. Feel free to also submit a Star Rating on the Behr Deckover coating. Bring new life to old wood and concrete surfaces with BEHR PREMIUM DECKOVER. This 100% acrylic formula conceals cracks and splinters up to 1/4″, and creates a smooth, slip-resistant finish that also resists cracking and peeling. It’s available in 54 solid custom colors and is also great for decks, railings, patios, composite decks, pool decks, and walkways. Recommended for properly prepared exterior weathered or cracked horizontal and vertical wood and composite surfaces such as Decks, Railings, Porches and Boat Docks. Also great for concrete surfaces such as Pool Decks, Patios, and Sidewalks. Do not use on drivable surfaces such as garage floors and driveways. – Behr applies like thick paint and helps to fill cracks and conceal splinters. It looks like paint, not like a deck stain. Our customer complained about dirty footprints always showing up on the deck. Had to scrub to remove. – Excellent UV protection from graying in the areas that were not peeling. – One Winter and the Deckover was peeling heavily. We prepped according to manufacturer directions so we know that was not the problem. In general, we have found that all Behr stains have a tendency to peel, especially after a Winter in a cold weather state. Here at DeckStainHelp.com, we have worked hard over the years to become your trusted reference for deck stain opinions and consumer reviews. We thank you for your continued support. Well, Rust-Oleum is back at it with a newer, relabeled version of their Rust-Oleum Deck Restore. The Deck Restore version has failed miserably in the last 5-6 years and a Class Action lawsuit was settled in 2018. 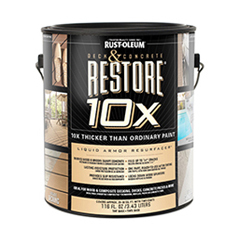 They still continue to sell the Deck Restore version to unknowing consumers but they have come out with the newer RockSolid Deck Coating as well. This new version is marketed slightly differently. It is a Deck Resurface product that uses a primer first and can also be done in one day. From what we have seen and heard, the Rust-Oleum Rock Solid is not much better than the Deck Restore and continues to peel and fail. If you have used Rust-Oleum Rock Solid, we would like to hear what you think, so feel free to leave a comment below and pictures of your completed projects if you have them. 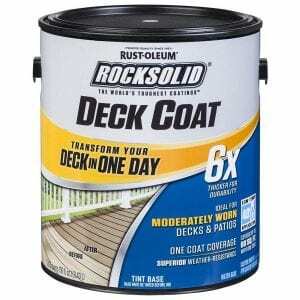 Transform your Deck in One Day with RockSolid 6X Deck Coat. This innovative one coat deck resurfacer is ideal for moderately worn decks and patios. It is formulated to resurface wooden decks and concrete patios. – The finished appearance of this product is poor. It looks “clumpy” and dirt has a tendency to stick to the surface as the product cures. The color did not match the color on the chart. – Does not gray in the areas where it has not peeled. – Of all the “Deck Resurface” products the Rust-Oleum version peels the worst. It started peeling within the first year of application in our cold weather state test deck. Here at DeckStainHelp.com, we have worked hard over the years to become your trusted reference for deck stain opinions and consumer reviews. We thank you for your continued support. 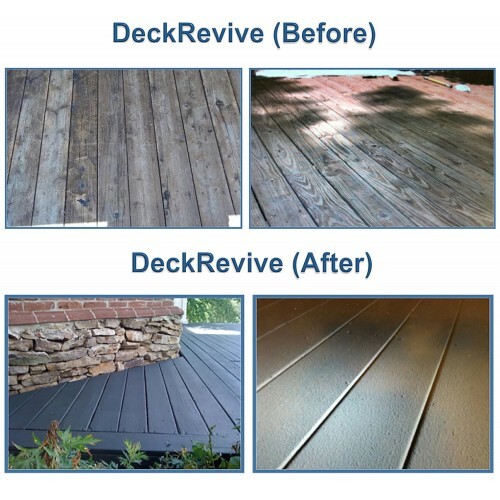 Our customers who have used Rust-Oleum Deck Restore continue to give scathing poor reviews about the appearance and longevity of their deck restoration projects. Numerous issues with peeling and a class action lawsuit as well. If you have used Rust-Oleum Deck Restore, we would like to hear what you think, so feel free to leave a comment below and pictures of your completed projects if you have them. Why repaint when you can revitalize your deck—with Rust-Oleum® Deck & Concrete Restore ®? This liquid-armor resurfacer forms a tough, resilient coating over existing decking. It lasts for years with minimal maintenance! Limited lifetime warranty. – Of all the “Deck Resurface” products the Rust-Oleum version peels the worst. It started peeling within a few months of application. Here at DeckStainHelp.com we take pride in the fact that we have become the Internet’s go-to source for keeping up to date on the latest in deck staining news. Be sure to do research about the brands of stains you choose to use for your deck stain projects to avoid catastrophes. If you have ever used Olympic Rescue It, feel free to leave a comment below. Olympic Rescue It may fit the term “it’s too good to be true.” This Olympic paint and stain hybrid product is marketed as a resurface DIY product. It claims to be the ultimate remedy for severely weathered or damaged wood surfaces. 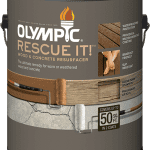 Olympic claims that Rescue It is a resurfacer and sealant all in one for wood decks that are damaged beyond conventional restoration services. They also market it to be used on concrete surfaces as well. This hybrid sealant is supposed to fill cracks and hold down splinters to deliver a slip resistant textured finish that is supposedly barefoot friendly, shown by the picture of bare feet on the front label. It is a 100% acrylic waterproof protectant that Olympic calls a “high-performance coating” offering outstanding elasticity. But recent customer claims and lawsuits say differently. Since the article was first originally published, we have had numerous comments from consumers who have used the Olympic® RESCUE IT!® and have had a poor experience with peeling and failure. 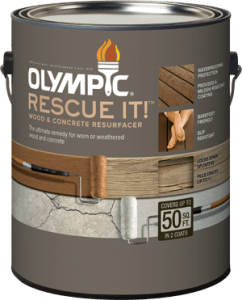 If you have used the Olympic® RESCUE IT!® please upload and post pictures of your exterior wood or deck with the Olympic® RESCUE IT!® on it. A short description of your experience would be helpful as well. This can be done in our comment area below. Feel free to also submit a Star Rating on the Olympic® RESCUE IT!® coating. Olympic® RESCUE IT!® Resurfacer is the ultimate remedy for worn or weathered wood and concrete. With the proper preparation, this 100% acrylic coating fills wood and concrete cracks up to ¼″ deep. Don’t replace it. Rescue it! – The Olympic Rescue It version of “deck restore type” products is no different in that it still looks like a thick paint was applied. Overall though it did have a nice uniform appearance. – No graying of the deck as this product does not allow the stain through to change the appearance. – The Olympic Rescue It performed better than the Behr Deckover and the Rust-Oleum versions but not nearly as good as the Gulf Synthetics brand that we have tested. After the first Winter, about 1/2 of the deck had some issues.